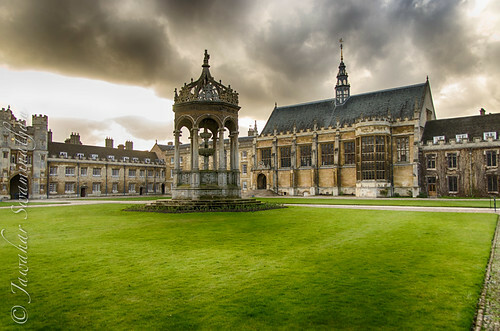 Of the 31 constituent colleges that make up the University of Cambridge, none is more famous than the Trinity College. Apart from being the largest constituent college in Cambridge (or Oxford), members of the college have won more Nobel Prizes (32 of a total of 75 awarded to Cambridge University members) than any other institution in the world! 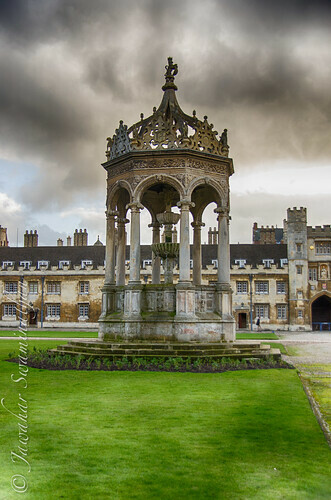 The college itself is one of three royal colleges in Cambridge (St. Johns and Kings College being the other two). 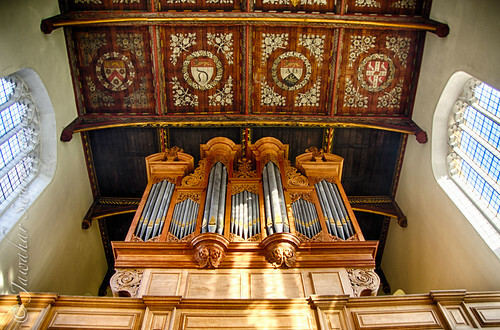 Trinity was established in 1546 by King Henry VIII of England, but it was under the leadership of Thomas Nevile, that the college was designed and built. 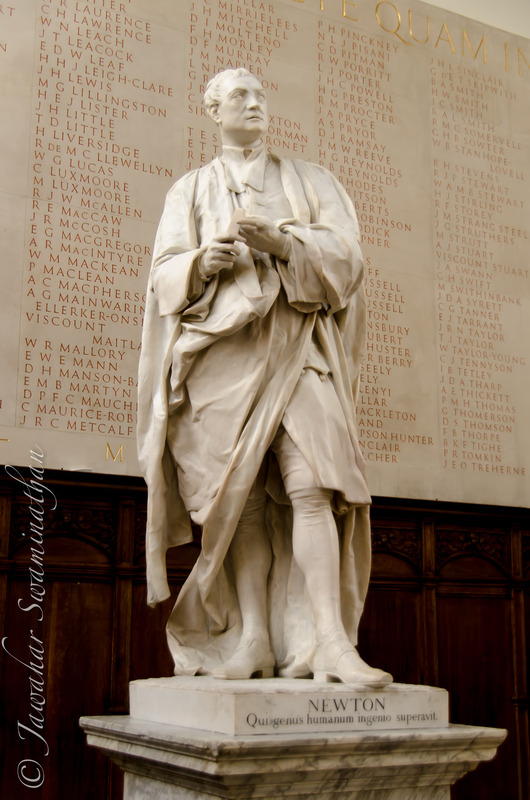 The list of notable alumni of Trinity makes impressive reading, from Isaac Newton, Lord Tennyson, Ernest Rutherford and Niels Bohr to Jawaharlal Nehru, Amartya Sen and Bertrand Russell, and definitely worth a visit on days the college is open to visitors. The following pictures of Trinity College, were all shot in sets of three and then merged into HDR using HDR Efex Pro from NIK software. 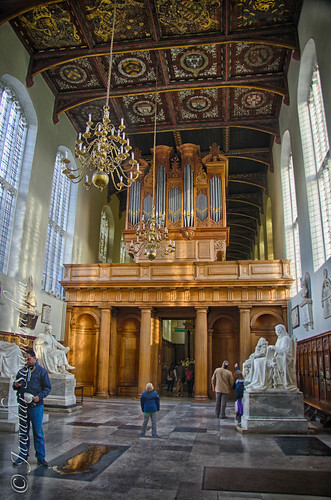 ante-chapel with marble statues of famous Trinity alumni. 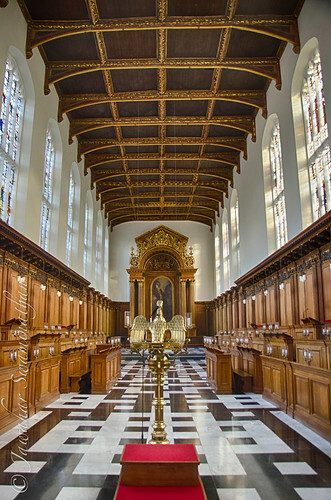 Trinity college chapel with the eagle lectern (foreground) and stalls. 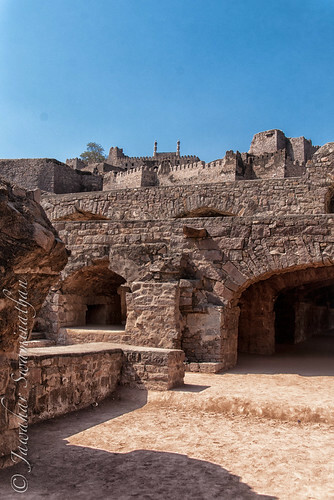 I took over 150 pictures at the Golconda Fort, Hyderabad, India on my last visit, which felt like a lot at that time. Now in the comfort of my computer at home, I wish I’d taken another 150-odd. 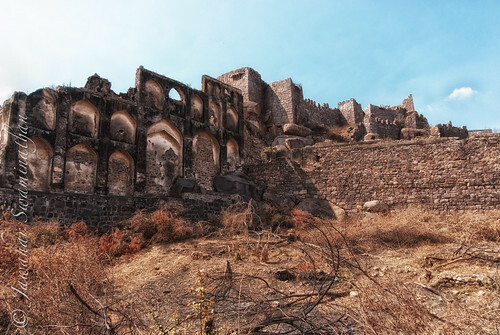 The Golconda fort offers endless possibilities for photography. There are relatively unexplored nooks and crannies and it isn’t too difficult to get away from the throng of visitors to the fort. Half-way destination at top. As seen from the office complex of buildings at the foot of the fort. 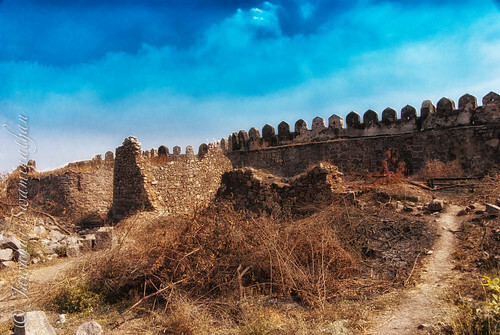 Crumbling buildings inside the walls of the fort. 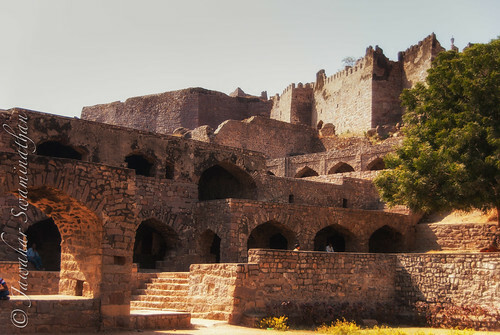 In its heyday, this fort and its buildings would have been a site to behold. Ancient steps that no longer lead to a destination. It is easy to let the mind wander into imagination of how this place would have looked in its heyday. Now all that remain are crumbling stones that tell a story of a time gone by. Rooms stark with their shorn walls, mute in their silent despair, as they too gradually disintegrate to dust. 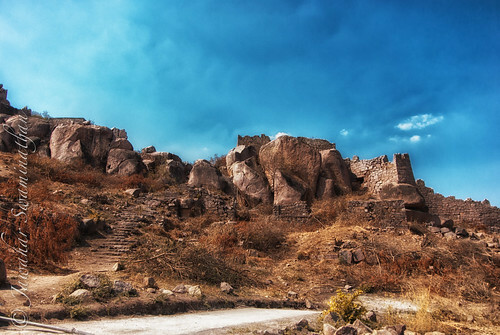 In the next installment of this series on Golconda Fort, I shall be covering the journey to the top of the fort. 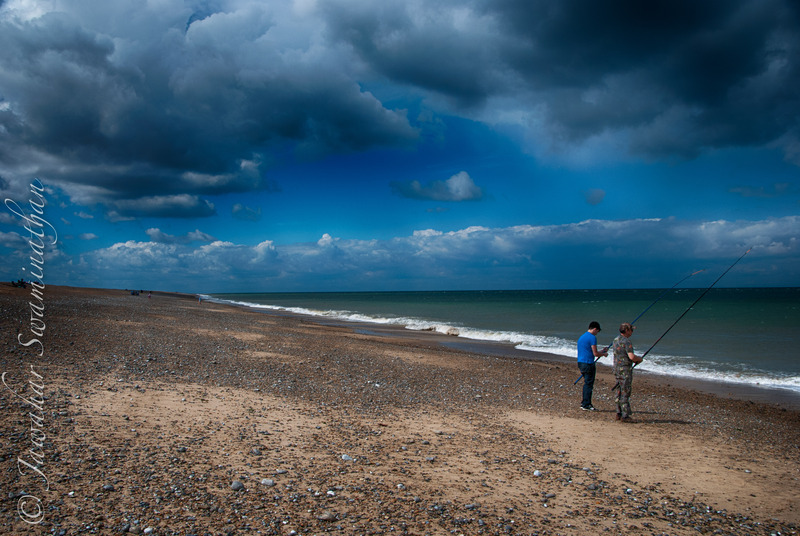 Please click on any picture to see further detail on my flickr pages. I love selective colouring photographs. While this is one of the most time-consuming step of a post-processing workflow, it can breathe life into otherwise ordinary photographs. 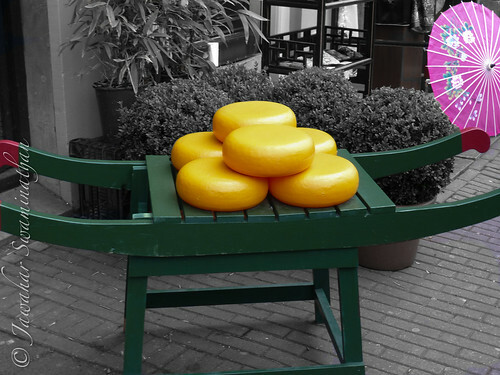 It can also be used to draw attention to a particular object in crowded field. 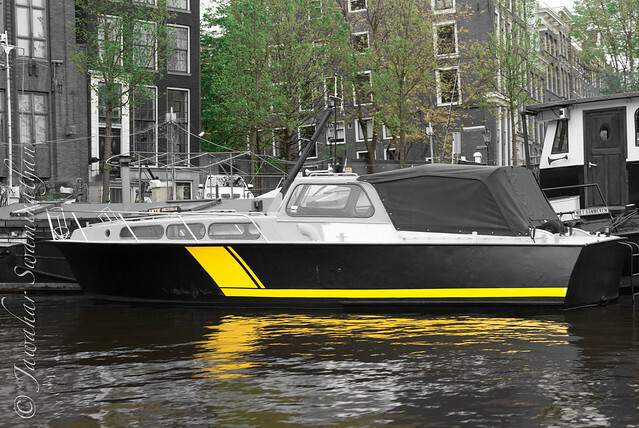 The following pictures are my experiments with applying selective desaturation in Adobe Lightroom on a few pictures from my trip to Amsterdam 2012 spring. 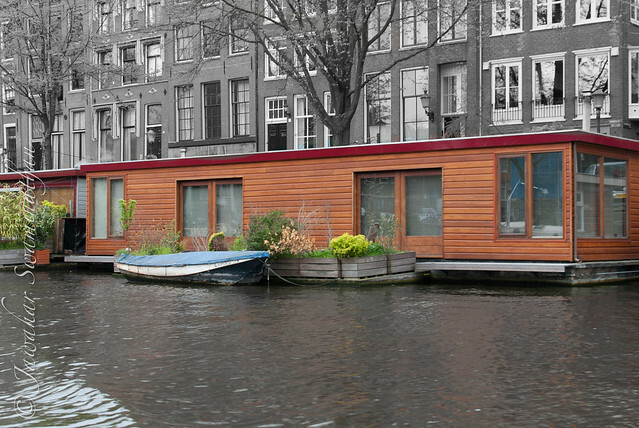 Housing shortage in Amsterdam has resulted in these unique permanent water homes, with plumbing, electricity and other mod cons. 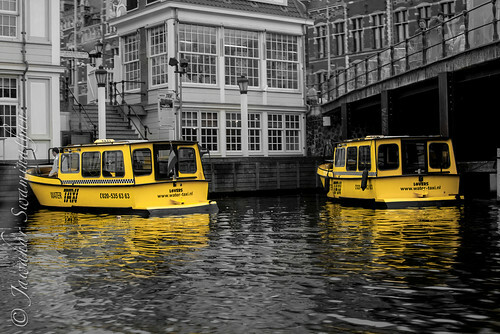 Previously posted picture of water taxis in Amsterdam. You may wish to click on the pictures to see a larger version on flickr. As always I look forward to comments and criticisms. 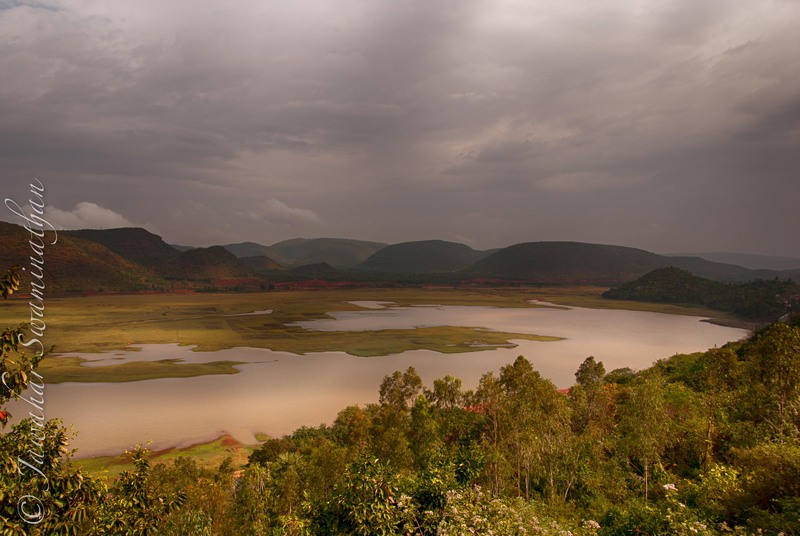 Annavaram is a village situated about 125 Km south of Visakhapatnam in the East Godavari district of the Indian state of Andhra Pradesh. 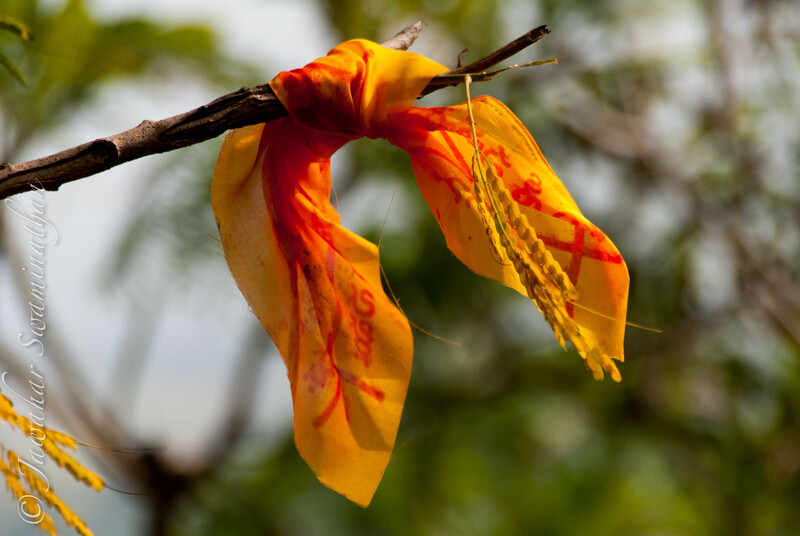 The village is famous for the holy hindu shrine of Sri Veera Venkata Satyanarayana Swami situated on a hillock in the Ratnagiri Hill range of the eastern ghats about 300 feet above mean sea level. 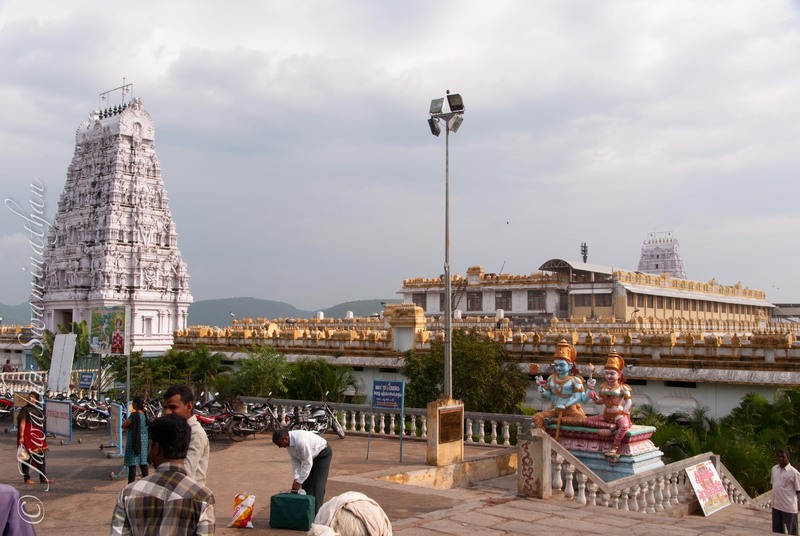 The temple itself is a short climb from the Annavaram village, and is also accessible by car. 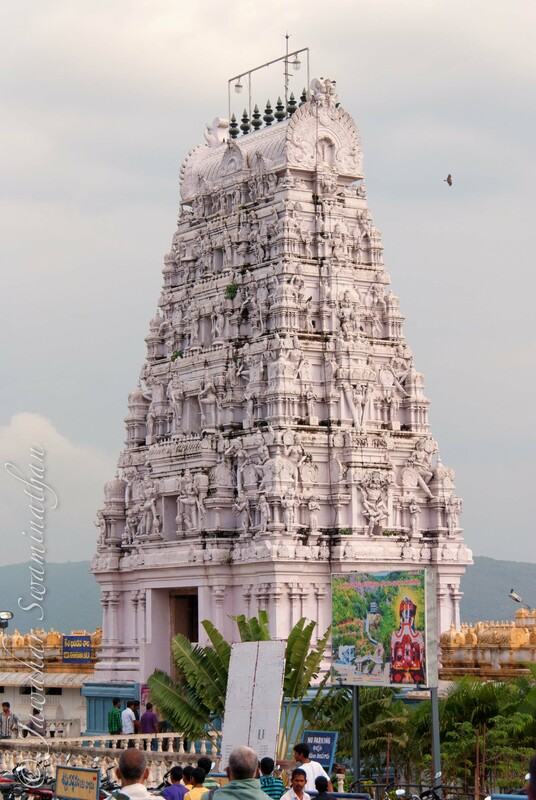 Legend has it that the location of the statue of the deity appeared in a dream to a local brahmin E. Prakasam, who with the help of the local zamindar (landowner) Sri Raja I.V.Ramarayanam traced the statue to the top of the hillock and helped to set up the temple in about 1891. The temple of Sri Veera Venkata Satyanarayana Swami, Annavaram. Both the western (foreground) and eastern entrance gates (gopurams) are visible. The name Annavaram is a conjugation of the words Anina (Wanted) and Varam (Boom). 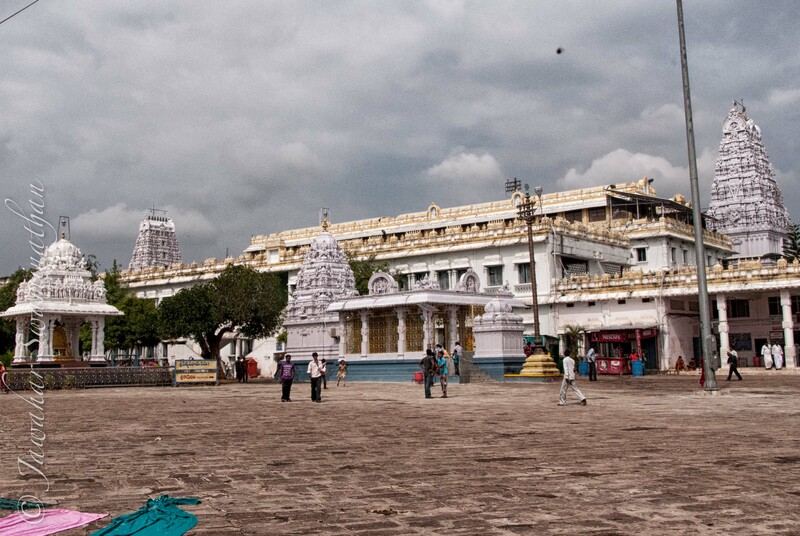 This temple is now considered to be second only to the famous Venkateswara temple at Tirupati in Andhra Pradesh. 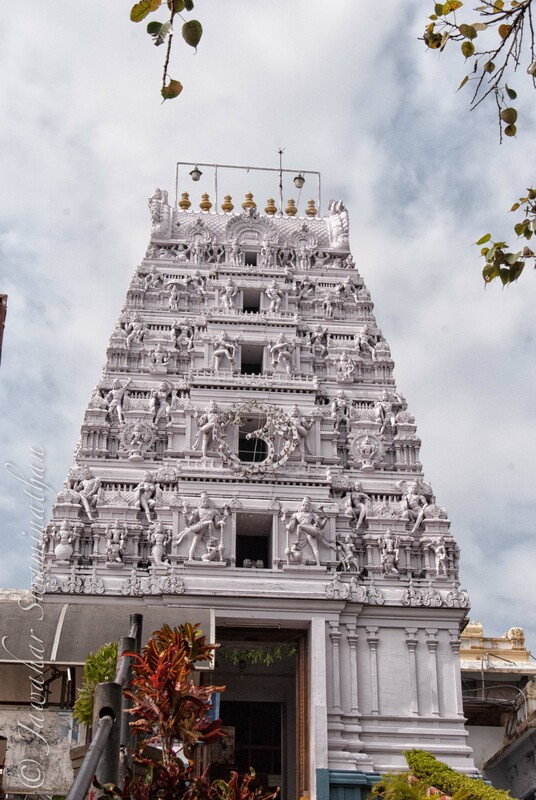 The temple is constructed in the classical Dravidian style with two tall towers (gopurams) facing due east and west. The main entrance (East) of the temple. 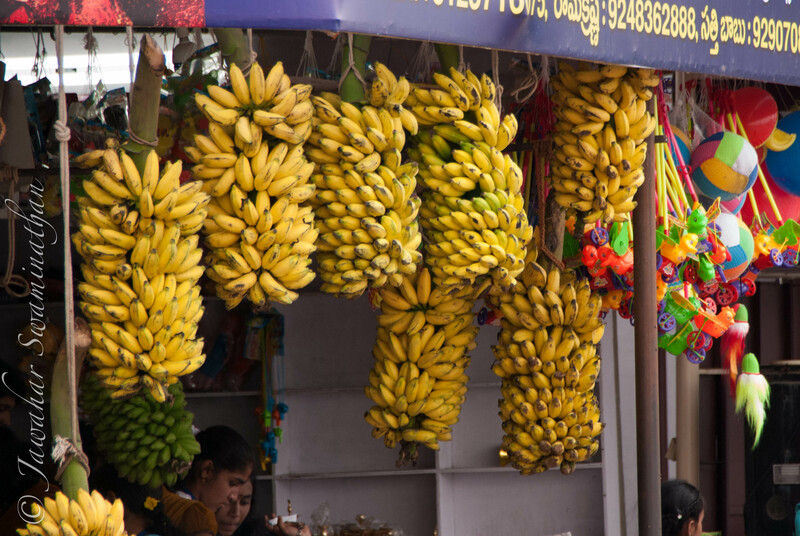 Fruits and other offerings (and souvenirs) on sale at a local shop in the temple complex. 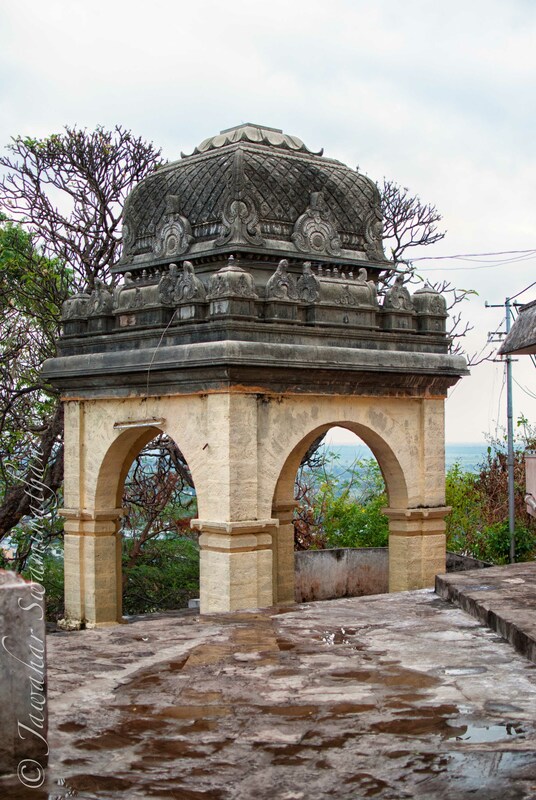 The temple complex offers great views of the Bay of Bengal (on a clear day) 11 miles east of the temple as well as the village of Annavaram 300 feet below. Far from the maddening chaos of Annavaram below. The large central courtyard of the temple has facilities for pilgrims to bathe, stay or eat, as well as halls and rooms for various religious ceremonies (marriages etc). Central temple courtyard, with the western entrance on the far left. A stroll through the temple shows that the temple was constructed and extended over time, with some old buildings and some more recent construction. The oldest part of the temple as it stands today dates to just over 110 years. But if the legends are true, then a temple may have existed in this very place for many centuries before falling into disrepair. Pilgrims flock to Annavaram from all over the state to fast and pray. On any day of the year, the temple is a hub-hub of activity. I must confess that I’ve never been inside the sanctum itself in all my visits to this temple. I find the environs of the temple fascinating and love observing the faith and piety in the pilgrims visiting the place. I also find the views in and around the temple beautiful and serene. Rays of the sun casting a beautiful light on the Pampa reservoir, as seen from the Annavaram Satyanarayana Swamy temple. Slight HDR effect. Annavaram is definitely worth a visit, even if you’re non-religious, and particularly if you are a practicing hindu. 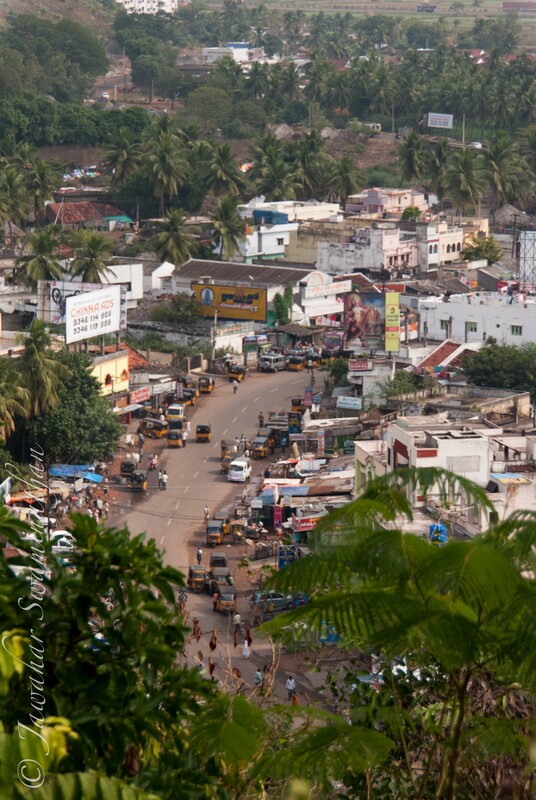 The trip from Visakhapatnam takes about 2.5 hours by hired taxi cab. On a clear day you should also be able to see Bay of Bengal (but I’ve never managed to see this in all my visits).